It's a cross between Treasure Planet and Sword in the Stone. (it's not Star Chaser). It's a family animated movie about a blonde boy. He finds a sword with an invisible blade, the blade materializes when he uses it. He is on board a talking spaceship - the spaceship has a little rectangular head that pops out when he talks to the boy. At one point the boy asks the ship to do something and strikes the console. I think he was searching for a treasure or something. The movie is not set in space exclusively, they travel around on a planet. I don't remember other characters. Sorry, I know its vague but that's all I can remember and I'm desperately trying to find it. I know you said not Starchaser: The Legend of Orin, but are you sure? 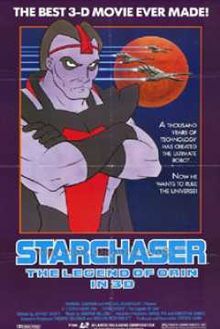 It features a sword with an invisible blade, it came out in 1985, and it has him going from living on a planet to searching for the sword's blade. The twist is that, after losing the hilt, he learns that the sword never really had any power. The "invisible blade" was something that he was generating. What is this '90s–'00s sf movie with a Guyver-like, Max Steel-like bio suit?